Title text: "P.S. We're going to the beach this weekend, so I'm attaching my preregistration forms for that trip now, before we find out whether it produces any interesting results." Synchronicity alert: the guy I follow on Twitch who plays TRLEs is filling in the other sessions with this same Zelda game lately. Otherwise I probably never would have heard the name. What I don't understand about this comic is why he would seem to be suggesting that negative results aren't important to know. If you try study the correlation between a thing, and you can't find any correlation, that's pretty damn important. Even more so when one in twenty similar tests might find a correlation due to statistical or testing error, and they are the only ones that publish, suggesting to anyone who researches the subject that there is a correlation when there shouldn't be. He's not doing that. However, he's also not confirming negative results as being negative as no test was made to end up negative, which is also 'useful' information (if people aren't reporting negative results, are they not reporting them or were they not even looking). And the more we know that people aren't looking for the Invisible Pink Unicorn, the less sure we can be that the low reporting rate of failure to find is because the null hypothisis is in turn null. Soupspoon wrote: He's not doing that. However, he's also not confirming negative results as being negative as no test was made to end up negative, which is also 'useful' information (if people aren't reporting negative results, are they not reporting them or were they not even looking). And the more we know that people aren't looking for the Invisible Pink Unicorn, the less sure we can be that the low reporting rate of failure to find is because the null hypothisis is in turn null. orthogon wrote: What about non-pink non-unicorns? 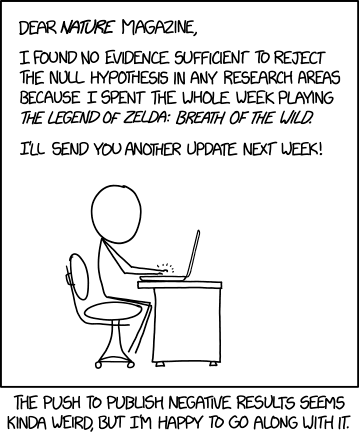 xkcd is Seinfeld with scientific and technical matter added. I just looked, and found several of them at our bird feeder. One was actually a raven, which is quite unusual in these parts. We only see them one or two times per year, which is sufficient to convince us that they still exist. Or at least they did a few minutes ago. I was really surprised to learn that Australian ravens are black. Like I knew about the swans already, but is everything backward down there? Pfhorrest wrote: I was really surprised to learn that Australian ravens are black. Like I knew about the swans already, but is everything backward down there? Apparently not. But the latest fun news about those black swans is that some of them are surfers. (Of course, this isn't really new news; that report is from 5 years ago. That game is overrated. I enjoyed skyward sword more. Surfing swan are cool though, thanks. teelo wrote: That game is overrated. I enjoyed skyward sword more. I'm probably confusing twilight princess with skyward sword. I spent a lot of time in BOTW running around aimlessly with no idea where to go, and killing easy enemies then suddenly getting oneshot by stuff. It could have been a great game but they deviated from some of the Zelda norms a bit too much. Two stories about the same bird. This is on central Vancouver Island in British Columbia.